First Line: The farm-to-market road was vacant, the day's traffic settled and tucked away as the big red sun dropped below the horizon. Sonny Burton now has only one arm, thanks to Bonnie Parker. Losing the shoot-out with the infamous Bonnie and Clyde in such a way meant his retirement from the Texas Rangers, and he's finding it hard to acclimate to his new life. Then Aldo Hernandez, a hospital janitor, asks for Sonny's help. Aldo's young daughter has gotten mixed up with two brothers who are involved in a series of robberies. He knows that type of life means death, and he wants his girl back before that happens. Sonny agrees to help, but he finds his attention divided. You see, someone in the area has started killing young women and leaving their bodies out in the fields for the crows to feast upon. 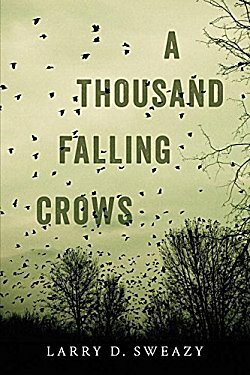 Having really enjoyed Larry Sweazy's Marjorie Trumaine mysteries set in 1960s North Dakota, I didn't hesitate to pick up A Thousand Falling Crows. It's one of the best decisions I've made so far this year. Sweazy's lean, poetic writing style is so evocative of the Depression and the Dust Bowl that I felt as though I were following along with Sonny every step of the way. Sonny Burton is a sort of Everyman, struggling with all the changes in his life, with loneliness, and with his lack of relationships. He's a man without a safety net, and just as we see him reaching the end of the long, dark slide that leads to eating his gun, two things happen: Aldo Hernandez reaches out for help, and so does Blue, a mangy stray hound with a broken leg. Sweazy has written the compelling story of a lonely man who finds a reason to get busy living. As he tracks down Aldo's daughter, Carmen, we see her life from her point of view. As he is forced to live with Blue, we see him coming out of his shell of loneliness. The excellent mystery the author has crafted almost comes as an afterthought in my mind because of the strength of the book's characters and setting. And above it all is a Greek chorus of crows, letting us see it all from their vantage point. If you haven't sampled Larry D. Sweazy's writing, I hope you change that as soon as you possibly can. I did, and now I want to read everything he's ever written. I really like the time period and setting for this one, Cathy! And what an interesting perspective for the story, too. It sounds as though Sweazy has done an effective job of showing the lifestyles of the times, too. little wonder you enjoyed it. I ate it up with a spoon, Margot! OK, I just went and purchased this book. This book speaks to too many aspects of my life. My parents grew up in the Texas Panhandle and so would have been there during this time period as children. My father worked with the Rangers, but wasn't one himself. And my grandparents and parents spoke so vividly about the Dust Bowl time. Yep, I need to read this. I wondered if it would strike a chord with you, Kay. I hope you enjoy it. I just picked up A Thousand Falling Crows at the library yesterday. Currently I am reading See Also Deception and enjoying it very much. I was very taken with the character of Margorie Trumaine in the first book See Also Murder. Thanks for introducing me to this wonderful author through your reviews. You're welcome, Lynn. I hope you enjoy reading about Sonny Burton just as much. So this is set in Texas during the Great Depression? Kind of like Steinbeck's The Grapes of Wrath era. I love Marjorie Tremaine so I may like this book. It's going on the TBR gigantic list. I think you'll enjoy it, Kathy.